It’s September. My eldest niece just started school yesterday and we have cold and rainy weather. I mean, it’s like the universe is telling us we can put summer dresses into storage because we’re not putting them on again for a year. It’s a bit depressing, really. Good thing at least there’s summer fruit still available and figs have just hit the shelves and are everywhere. 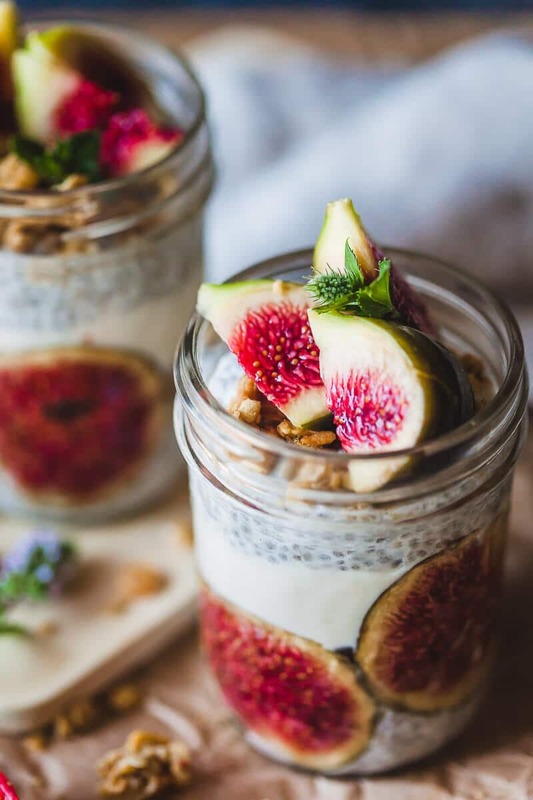 Making light and colorful dishes such as this beautiful Almond Milk Fig Chia Pudding is what’s keeping my morale up. This and our upcoming holidays to la bella Italia. I have said this before, but I can say it again: I am a picky eater, I admit it. I have food prejudices (mushrooms) and some foods I purely dislike (beans!). Figs were a part of my picky eater selection… until now. 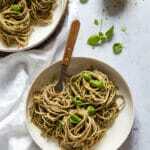 Since starting a food blog I have been more open to foods, but aging helps as well, as I now prefer savory or a bit bitter foods (hello radicchio!) to sweets. 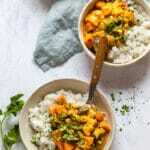 Most of our recipes, if they’re not cakes or muffins, have no added sugars at all, as we rely on fruit for sweetness and most of the time, that is enough. But back to this treat. Oh, my. 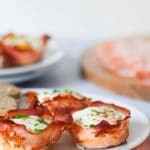 Now, this is a delicious and healthy breakfast. The mashed figs mix with the chia seeds and almond milk to create a light, creamy and sweet combination. This is pure heaven. And coming from a picky eater! Chia seeds are rich in omega acids and protein and low in carbohydrates. 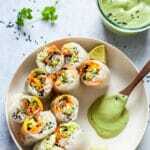 The soy yogurt provides extra creaminess and some tanginess. The figs are sweet and the granola crunchy. 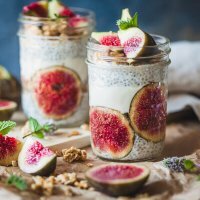 This Almond Milk Fig Chia Pudding is just my perfect breakfast! Place chia seeds in a container and add almond milk and a drop of vanilla extract. Stir well to combine, close container with a lid and set in the fridge to soak for at least 2 hours, or overnight. Peel and mash 3 figs with a fork. Make a few fig slices and cut into quarters the rest. 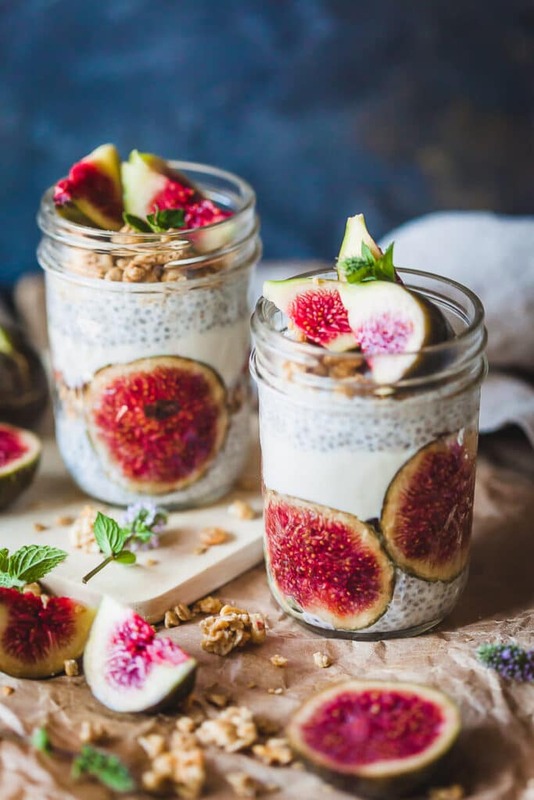 In the morning, take the chia pudding out of the fridge and start assembling your breakfast: place a few fig slices on jar walls and press in with your fingers or a spoon to make them stick. Add a couple of spoons of chia pudding on the bottom and a layer of granola. Top with mashed figs, then add a few spoons of yogurt on top and finish with the rest of the chia pudding. 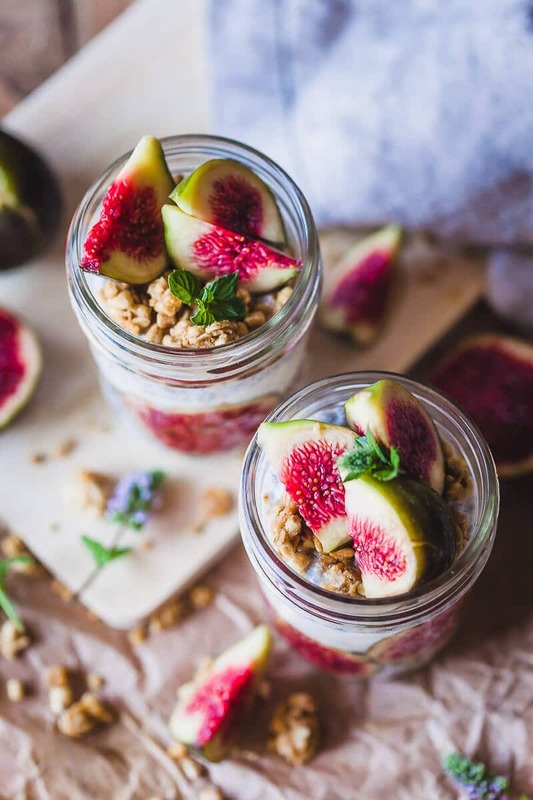 Decorate with figs slices and granola on top on serve. 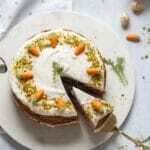 Been coming across plenty of fig recipes lately and this is one of my favs because of its sheer simplicity. It doesnt hurt that its vegan as well. Thanks for sharing this.